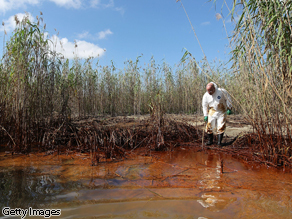 Greenpeace USA executive director Phil Radford inspects oil-covered reeds in Louisiana. One month ago today, the Deepwater Horizon exploded in the Gulf of Mexico tragically killing eleven men working on the BP oil rig and choking the Gulf Coast with millions of gallons of oil — oil that is still pouring into the waters today. Thirty days later, we are no closer to knowing how to contain and stop the leak, or how extensive — or long-lasting — the damage will be. But we have been awakened to the dirty realities of our fossil-fuel addiction. Thirty days later and the guesswork to basic questions continue. Even the most conservative estimates have the oil output at 210,000 gallons every day. But experts think that number could be as high as 4,200,000 gallons a day — 20 times as high. How far will the oil slick spread? Currently nineteen percent of the Gulf of Mexico has been closed to fishing with the spill potentially reaching the Florida Keys and even further to Cuba. As we try to understand the scope of the spill, scientists are growing increasingly concerned about the plumes of oil that are spreading beneath the ocean surface – destruction unseen to us but felt at great depths. We don't have answers from BP, but we do have empty assurances that the impact will be "very, very modest." The Gulf Coast Catastrophe has already done heartbreaking damage to both our environment and the American worker, with no end in sight. In the regional fishing communities, the spill's decimation of sea life has left thousands of fisherfolk scrambling to make ends meet and wondering about their future. The strong regional tourism industry, particularly in New Orleans, now has another disaster to recover from just a few short years after Hurricane Katrina ravaged the coast. Even shipping in the Gulf — a crucial industry not just for the region but for the entire country — is in danger as shipping lanes remain vulnerable to contamination that could slow traffic considerably. That economic damage does not even touch on the harm that BP's oil spill is doing to the regional environment. Again, our information is partial — but we know that marine wildlife is in incredible danger. It could take years, or even decades, for the ecological system to recover from this. BP must be held accountable. Just this year, it closed its solar manufacturing plant in Maryland, resulting in 320 lost jobs. Now, with the spill, the oil giant has shut down not just a single factory but entire industries, costing thousands of jobs. It's time for BP to build up the economy instead of tearing it down. BP can start by investing in new, safe jobs in the Gulf Coast to replace the jobs they have destroyed. A $1 billion, long-term investment in clean energy for the region would be just 15% of BP's profits last quarter but would do wonders for the American worker. That kind of investment could put solar panels on every roof in the Gulf region. It could create 20,000 jobs while giving a serious boost to the regional economy. This investment could kick start struggling industries such as manufacturing, installation, maintenance, and transportation. It's also time for our government to step up. We cannot rely on BP to adequately repair the ecological and economic damage it has done (and is continuing to do) without strong federal intervention. President Obama must take responsibility for holding BP accountable, and restoring the environment and communities impacted by pledging federal oversight of BP's clean-up and containment efforts — today. Thirty days is too long to wait for answers. And we can’t wait another thirty for progress. Let’s act beyond petroleum today. Phaedra Ellis-Lamkins is the CEO of Green For All. Editor’s Note: Green For All is a national organization dedicated to improving the lives of all Americans through a clean-energy economy. The organization works in collaboration with the business, government, labor, and grassroots communities to create and implement programs that increase quality jobs and opportunities in green industry – all while holding the most vulnerable people at the center of its agenda. Why isn't the U.S. or the EPA taking steps to prevent the oil that's already spilled into the ocean from reaching shore? Straw and/or hay is an excellent choice and has been used in the past! At the very least, they (BP) should let private companies and citizens try something to sop the oil up. It's our land, after all ! I don't even know what to say about this tragedy... After a month, it's still going like mad (with the insertion tube catching a tiny portion of the giant spill.) We don't even know the long-tern impacts to the ocean. And what about the already Katrina-ravaged Gulf coast??? This is all too much for me. Combined with the coal mine explosion last month, we need to work toward killing our addiction to fossil fuel energy – let's get clean energy as a top priority for our lawmakers. Our kid's kid's kid's deserve it!